At some point you will encounter and consider various filters that can be screwed onto the front of your lens. Many of these filters are designed to achieve special effects or provide specific correction capabilities while giving you a new creative tool. From a beginning photographer standpoint, there is one filter that you should consider a MUST every time you purchase a new lens. This filter is called a UV filter. It does perform a photographic function -- decreasing the amount and impact of UV light that enters your camera and reducing the haze effect common in landscape scenes. But these considerations are secondary due to the UV elimination built-in to modern DSLRs. However, this relatively cheap filter performs an even more critical safety function. This nearly clear filter protects the investment you made in your lenses. It shields the front element of your lens from fingerprints, destructive elements in the atmosphere that can act on the sensitive coatings of your lenses, water/rain and any accumulation of dust and dirt. 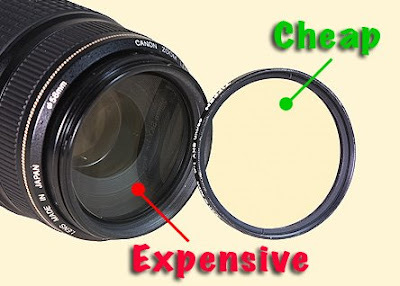 A UV filter (shown above on right) will protect your lens and your investment. Notice the 58mm notation on the barrel of the lens. This is the size filter this lens requires. Filters come in a multitude of sizes and there will be one just right for your lens. The size of the filter required is usually engraved on the lens barrel. If the filter gets dirty, lens cleaner and tissue will bring it back to new. Major camera manufacturers sell their own line of filters. In addition, Tiffen and Hoya are two popular makers of photographic filters. Spending extra to buy a higher quality UV filter will ensure that the glass and coatings on the glass will have minimal impact on overall image quality. Tip: Always purchase and install a UV filter when you buy a new lens. Enough said. I will provide more entries on filters and their specific photographic use. However this safety information deserves to be posted alone and first.